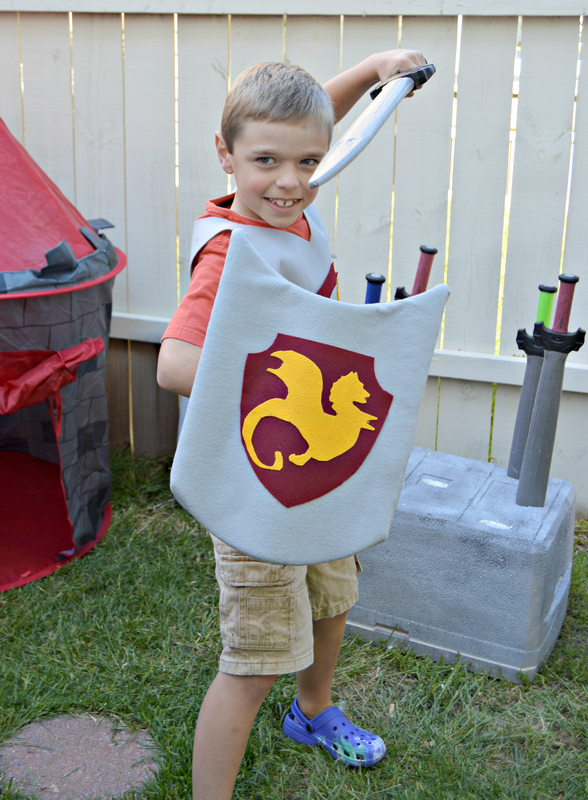 For the boys “Knights and Dragons” party, I wanted to create an opening experience that allowed the boys to transform into brave knights of the realm. I wanted to mimic the tale of the “Sword in the Stone”, so I came up with our own version that the boys could do when they arrived. Step 1: Spray paint your cooler! I did several layers of gray first, then covered with the stone texture. Step 2: Decide where you want your swords (depending how many you have). Using a sharp utensil (I used scissors) cut slits into the foam that are wide enough to fit the swords halfway down. Now that I had my stone ready, I wanted to create a staging area to set the mood! I thought our pop-up castle was the perfect backdrop (as did Squishy aka the one-legged photobomber), and there was room for our chest of knight tunics (which we’ll talk about in another post). The shields (another post!) framed the stone perfectly and everything was ready for our little knights to arrive. Our knights arrived and it was time for the ceremony to begin! Each knight was dressed in a tunic, pulled out a sword, then was given a matching shield. Did you miss the invitations? Check them out HERE! « 5 Ways to Get Kids Excited About Summer Reading! I was hoping you’d have a few more details on the tunic. I am not nearly as artsy as you two are but my son is having a knight party in two weeks and I am trying to figure out what I would like to do. The tunics look like something I could do. Any chance you could give some more detailed instructions? I cannot find them on the website. Also, if you need any more ideas, scroll down to the party section on the “honestly doable” tab (under projects)-all my knight party posts are there! I hope this helps, let me know if you have anymore questions!